Fursona Bio Thread. - page 3 - general furry discussion - Furtopia | Family Friendly Furry Forum and IRC Chat! Clothing - Black T-shirt and khaki green cargo pants OR black T-shirt and grey pants with leopard spots(She has NO fashion sense) She always has her blue flower in front of her left ear. She sometimes wears her mauve and pink collar. Likes - Cheese, water, cosy rooms, the cold. Dislikes - The heat, beef, open landscapes. Temperment and socialability - She is stubborn and short tempered, but when she is nice she is really cuddly. After she has a 'tantrum' she feels REALLY guilty. - Hair and fur: Scruffy white fur, medium spiked green hair. - Markings: Twelve black stars from his right hind leg across his back and grey ears. - Other features: three black hooped earring on his right ear, longer tail then most of his species and one ear is bigger then the other. Clothing/Personal Style: Loose baggie jeans with black and white metal studded leather belt, a baggie hoodie brown in color with a choke chain hung around his neck. Fur colors/patterns. Mostly gray with a tan snout and jaw. Long white hair, eyebrows, mustache and beard. Pink ears, nose, hands and feet. Eyes. Solid black with brown iris. Feral, Digitigrade or Plantigrade. Plantigrade only. Clothing. Suit coat and vest but never a tie or pants. Sometimes wears a fedora and shoes. Likes. Italian food, good conversation and loves to laugh at himself and others. Loves classical, bebop, east cost jazz, rock, hard rock, thrash and heavy metal. Dislikes. Braggarts, know it alls and drama. Temperament and sociability. Gullible and a bit naive. Masculine and sure of himself but still be the first to laugh when proven wrong. Just as comfortable being in a crowd as he is by himself. Loves to be mischievous with a somewhat dry and dark sense of humor. Persona picture. Nothing yet. Still working on it. Fur colors/patterns - Black fur with gold rings around the tail and ears, gold marking on the forehead and biceps. Clothing - Tend to wear a hoodie vest; meaning a vest with a sweatshirt hoodie attached, my arms are usually bare and under the vest I wear an old worn wifebeater that is a faded yellow and has been stretched and pulled enough to show off the top half of my pectorals. I also wear baggy cargo pants and love wearing old beat up Converse sneakers! Temperment and socialability - Tries to be friendly, and warm can be a bit shy. Reserved with really personal information. Additional facts: Has the faint odour of black pepper in his fur at all times! 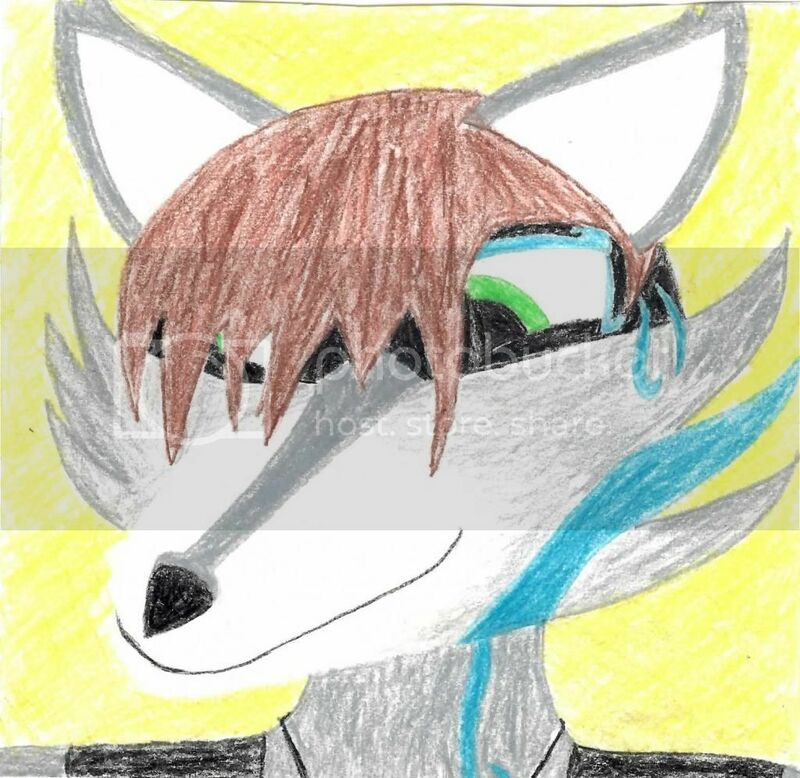 Fursona picture - Will update when commissioned finished. Likes: Reading, nature, hiking, food/cuisine, music, role-playing, travel, et al. 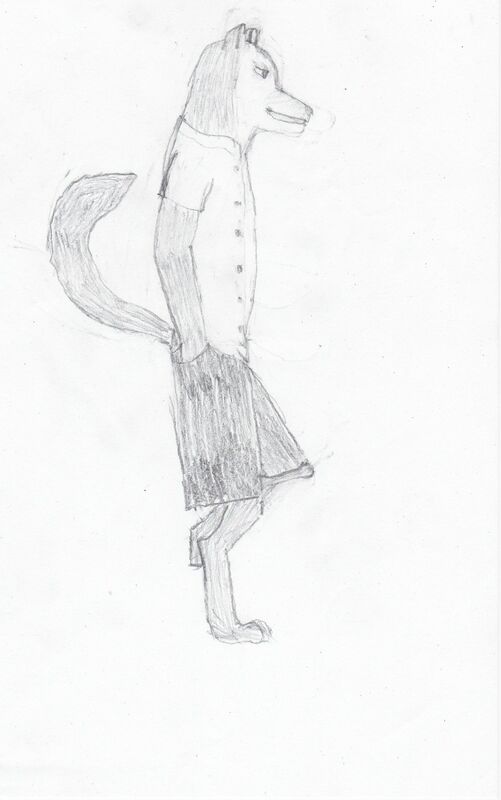 Fursona picture: In the works (meanwhile, see my avatar pic). Personality: friendly, shy (at first). personality: kind but hard to trust others, a good thinker. Other: he can't die so he doesn't like growing close to others. He travels around quite a bit too. the first one is Mu Rho Ni or just Mu for short he was found by a human research team studying the ruins of planet natalis. While searching these 2,000 year old ruins they found an old stasis pod with the Greek letters mu rho and ni scribed across the top along with native natalic writing which was illegible to the research team. They get the stasis pod open to find a lone member of the native species, a pup they would soon name after the letters scribed on his pod. Mu Rho Ni. 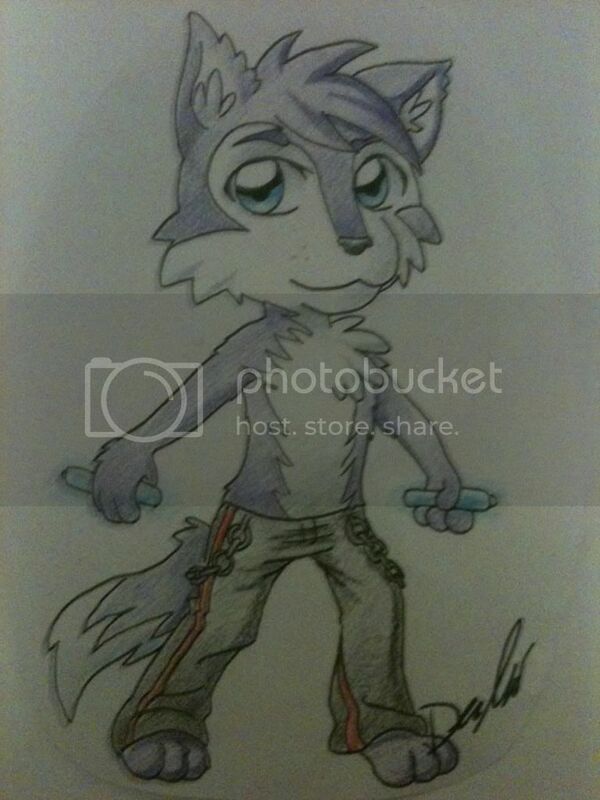 His species are bipedal wolf like creatures, he has blush grey fur with white underbelly and markings. when in danger he can go into feral mode in which his eyes turn black ant his strength is multiplied he also has the ability to harness and weaponize dark energy when in this state. the second is a work in progress. his name is Paal-Tior. I'm not sure exactly what species but he is going to be an aquatic/amphibious character. Height - Size of a large dog. Dislikes - The fact he's out of order. Temperment and socialability - Temp: Moody but friendly. Jealous of Freddy and the gang. Socialability: A lone wolf. If he wants company he will seek you out. 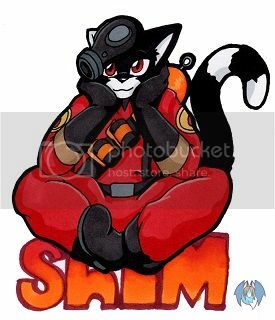 Height - Can change size at will, but mainly stays at 4" and 5',7"
Clothing -Always barepawed, sometimes in his norm form (5'7") he wears an airline pilot's uniform for his job as an airline pilot for TWA. Other times he loves dressing up in a classic pinstripe suit and Fedora. But in his 4" form, he wears nothing but the fur on his hide. Temperment and socialability - He's a really nice guy. He often acts like a goofball, but can be very professional when needed to. Trebor has no prejudices, he hates no one, no matter how horrible a person they are. He's not religious. Trebor is a First Officer for Trans World Airlines, based in Seattle, flying the Seattle-St. Louis-New York route. Once a year, TWA has him and his Captain do a special flight for a bunch of lucky people who won a contest, to a preselected destination in The Airline History Museum's Super Constellation. In his off time, he plays the trumpet and saxophone at a local jazz club, and loves wearing his classic dark gray pinstripe suit and Fedora while doing so. He also loves flying his 1961 Piper Cherokee. personality: A little bit of a twerp and very bossy, but he does get along with others. A little too privileged, narcissistic, but a great joker and very warm talker. Fur color/patterns - Purple with a white belly and white under tail. Temperment and socialability - He is friendly, but shy, he enjoys the company of others, he is the type that will go of on an adventure at any given moment. Fur Color/ Patterns: Very light orange with a white chest, stomach, and face. Temperment and socialability: He is friendly most of the time, but when agitated, can become witty, and even violent, in extreme cases. Willing to put himself in harm's way for his group if it could yield preferable results. Occupation: Disk Jockey at various nightclubs, which one depends on pay, and the hours he works. 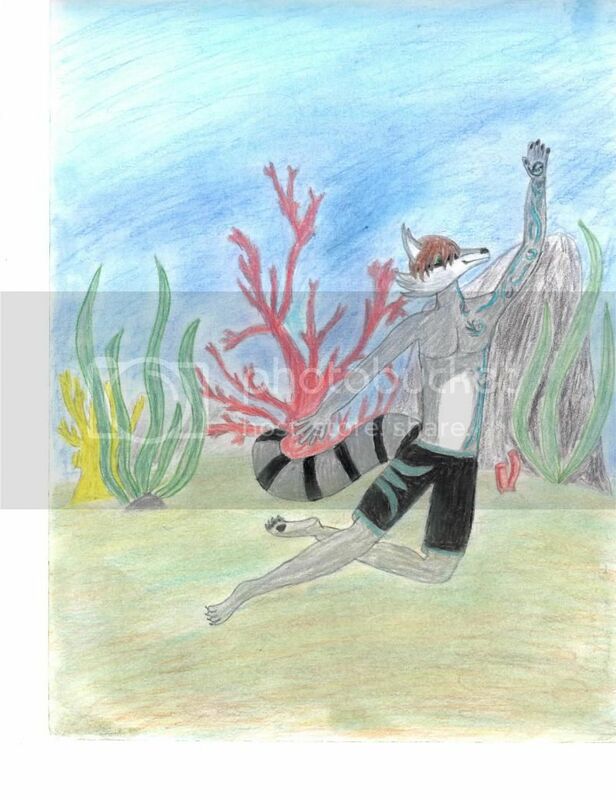 Fur colors and patterns: Typical grey raccoon fur and black mask marking with white fur on his stomach/abs area, grey tail with black rings like an everyday raccoon but has bright blue tribal markings all over the left side of his face, torso, and left arm which glow from time to time. Feral, Digitigrade, or Plantigrade: Usually plantigrade but walks digitigrade when sneaking. 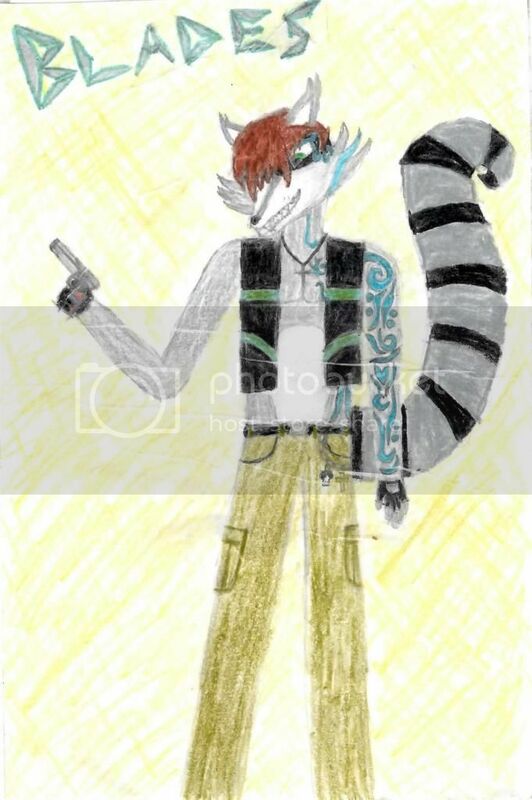 Clothing and accessories: Ripped black jeans or green cargos, sometimes wears a band t-shirt (Lacuna Coil, Coldplay, Shinedown...) but usually wears some kind of vest open to his fur to show off his tribals. Never goes anywhere without the silver cross around his neck which belonged to his late father. Also has a pocket chain with a cross keychain and a skull keychain. Likes: Cookies, orange soda, guns, video games, girls, cold weather, basketball, rock n' roll and alternative music. Dislikes: pop music, football, warm weather. Temperament and sociability: Blades is what you'd call a punk with a heart of gold. He is a touch arrogant and rebellious in addition to his bad temper but in general he's a good guy and more than willing to be your friend for life. Also enjoys hugs. Clothing and accessories: Generally wears a thin black band on the middle finger of her right hand, always wears glasses. 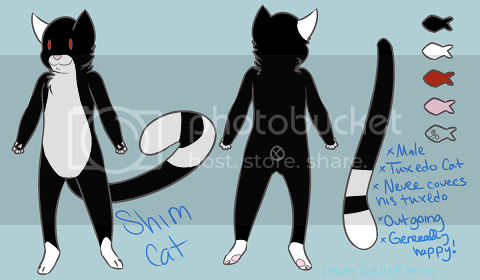 Fur colors/patterns - He has two main fur colors. A brownish fur covers the bulk of his body while his belly and muzzle are a lighter tan/cream color. The tip of his long tail is a darker brown. Likes - Knives, melee weapons, tails, snow, tea. Dislikes - Losing, loud noises. Temperment and socialability -Jethro is usually hostile, conceited, violent. However once he gets to know someone, he can be extremely friendly and protecting. Likes: Sugar, Video Games, Friends, Bacon, etc. Dislikes: Girls, Vegetables, mom's stir-fry, etc. Quote response from friends: Dude, your always hungry! or, Dude, you just ate lunch! Clothing: A lot of different things, but you'll hardly ever see me in anything that isn't black, except for the rarest of occasions. Cargo pants, platform boots and a tank top are usually the go, with the black leather trench coat when it's too cold/raining. Fur colors/patterns: Tuxedo. Black with white from his chin to his rotch, his right ear, a stripe and the tip of his tail, his feet, and his fingers. 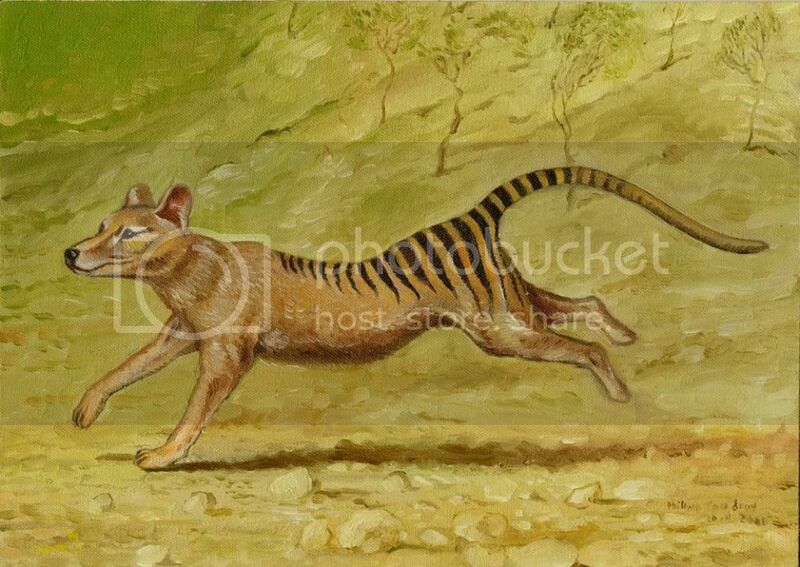 Distinguishing marks: Some of the white marks like his right ear and the tail stripe. 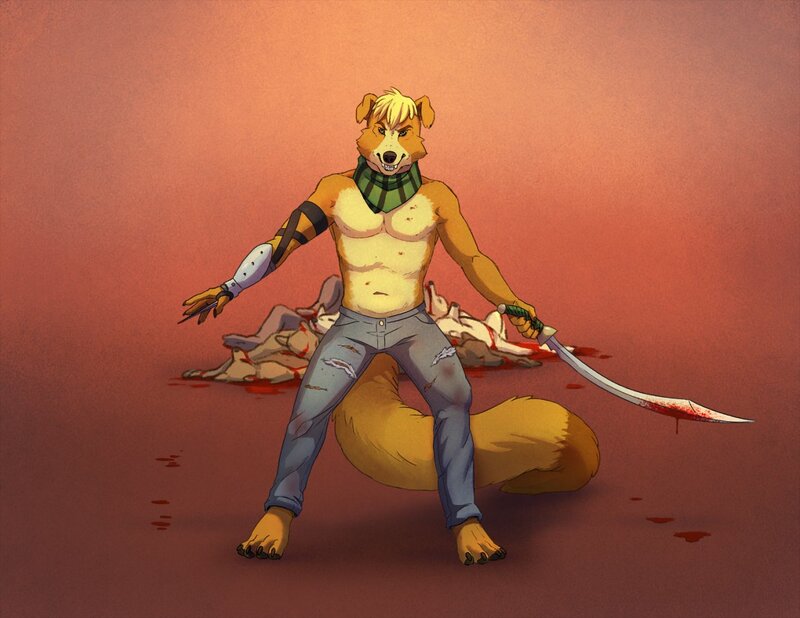 Feral, digitigrade or plantigrade: Digitigrade, usually. Likes: Singing, performing, entertaining, tabletop RPGs, video games, peanut butter. Attitude: Generally outgoing and confident. Fur Colors: Brown with tan cheeks and belly. White or cream tail tip. 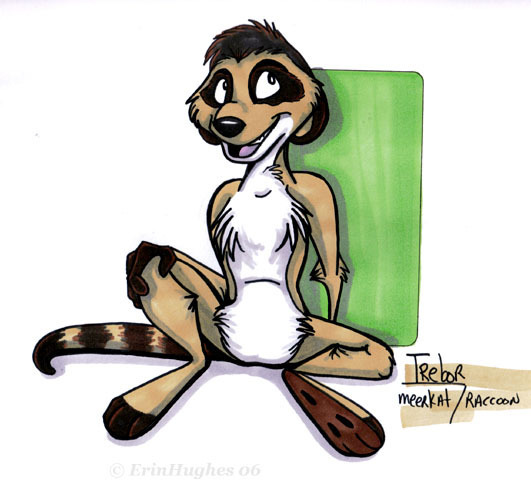 Clothing: Sometimes nekkid fursuit with orange bandana (green for St. Patrick's Day), but usually dessert tan coveralls, white hbt engineer's smock, or cargo shorts with camp t-shirt. May be depicted in Apollo-era hard suit or CAP/USAF uniform. Likes: Model rocketry, airshows, recreational shooting, collecting militaria, marching in parades, and renaissance festivals. Dislikes: Coarse language, loud/obnoxious entities, bad/risky behavior, aggressive drivers, yams and salads. Temperament/Disposition: This old howler tries to treat everyone with respect, courtesy, and cordiality as long as he is treated in kind. He is willing to share his knowledge on a variety of subjects to those with a sincere interest. A rather good hunter and fisherman, he can often find enough food from nature's bounty to sustain himself in the wild, but an occasional Tombstone pizza or a Hungry Man Dinner works too. Rocket comes from a big litter so he values his alone time. Version 1: Green body with white underside, black tipped ears, feet, and tail, with a purple strips along the color boundaries of the tail and limbs. Version 2: Black body with grey underside, green tipped ears, feet, and tail, with a purple strips along the color boundaries of the tail and limbs. Temperment and socialability: Generally quiet and reserved but caring, logical, and prone to handing out good advice. Fur colors/patterns: grey with black paws. A white chest, with black markings along my back, face and tail. Likes: to chat, hugs, singing (when no one judges or listens), drawing, video games, building complex things from legos, k’nex popsicle sticks, old logs or practically everything. Dislikes: being judged about his likings, being told what to do all the time, large assignments, clowns. Occupation: Student soon to be employed.